A MAJOR country artist is coming to Kat Country! 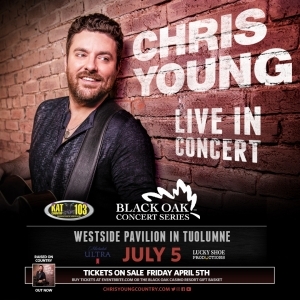 🎶 On Friday, July 5, come on over to Westside Pavilion and see Chris Young with special guest live in concert! Tickets go on sale Thursday April 5th. Use the code RADIO by clicking on the graphic above to be taken to the virtual box office! And as always, keep “Hangin’ On” to Kat Country 103 to win em before you can buy em!